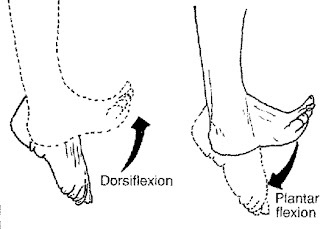 It seems that you can't have both - the more plantar flexion you have (swimmers), the less dorsiflexion you have. Good swimmers need to be able to point their toes so much that the top of the foot (instep) & the shin form almost a straight line. This forms a natural flipper that provides the swimmer with the best ability to propel & balance their swim stroke with their legs. In exact opposition to this, runners require strong dorsiflexion, at least being able to sit on their haunches with their heels on the ground without falling over. Of course you can have too much dorsiflexion as well, reducing the elastic "loadability" of the ankle joint for effective running propulsion. If you come from a swimming background & have reduced dorsiflexion, chances are you run very upright & have to twist the foot either inwards (internal rotation) or outwards, (external rotation) to accommodate this lack of functional mobility. Every time you kick while swimming you increase your plantar flexion, while running incorrectly does not counter balance this - you MUST work on regaining, maintaining the optimum level of dorsiflexion. I have recently seen so many injuries to high level pro triathletes who are strong swimmers, but not necessarily strong runners because of this situation. Of course there are other factors involved too - most critically a inflexibility or even rigidity in the big toe joint (does not bend sufficiently) - this is called flexor hallucis limitis & also needs to be addressed. Remember I am speaking from the point of view of a running biomechanist & not a physical therapist, so if you do suspect these are issues that are impacting your running, then see a pro. Other than the suggestions of such a professional, there are a number of ways that flexibility issues can be addressed. Using a technique for the soleus & gastrochnemius muscles (the calves), called active release stretching should prove very helpful.